Nowadays, people use their mobile devices to search for local businesses. Actually, according to Google, 75% of users prefer a mobile-friendly site when reaching a site through their gadget. So it’s pretty clear that your channel partners need a way to market themselves online with the ability to be seen in all devices. it’s obvious that your channel partners need sites to market themselves online. In this third and last installment of the “Features Your Private Label Website Builder Should Have” series, we’ll go over why this is a must feature for your private label website builder and how you can achieve a mobile optimized site with Empowerkit! In order for your partners to market themselves (and your brand) properly online, they’ll need to be able to have a presence on mobile devices. According to TechCrunch’s 2012 Survey, 2013 is the year of mobile devices since they will overtake desktops as the dominant Internet platform. If you want to be seen and don’t want devices to be a barrier between your company and your consumers, make sure that your site is mobile! 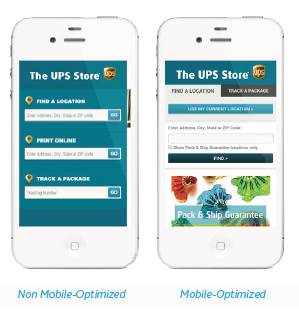 So what does a mobile optimized site entails? Your site should be responsive. What this means is that it should adapt to the width and tallness of different screens. As you may have noticed, different mobile devices have different dimensions and your site needs to fit correctly in each one. A mobile site is expected to have certain features for it to be more accessible for its users. For example, the use of buttons is very important in mobile sites: you can have a button to take the user to a map that displays your business’ location. This way, you avoid cluttering their small screen! Speaking of clutter, the design needs to be clean and easy to understand, highlighting the most important points whilst thinking of the user. Too much can be overwhelming so concentrate on your site’s main purpose and give the users a way to get around without having to navigate with ease! Fingers are tools to mobile users because they have to click, swipe and press on their screen to browse a site. They are interacting with their phone and you need to think about this in your mobile site: are the buttons big enough for their fingers to click on it?, is everything less than two clicks away? These are some things to think about when putting together a mobile friendly site! For example, in the next images, you’ll find a non-friendly and friendly mobile site. If you put yourself in your visitors’ shoes, which one will be the one that’s easier to navigate? And what’s more, in which site are you more likely to stay? According to Google’s “What Users Want Most from Mobile Sites Today”, 52% of users said that a bad mobile experience made them less likely to engage with a company. That’s money that’s going into your competitors! So don’t let it slide! 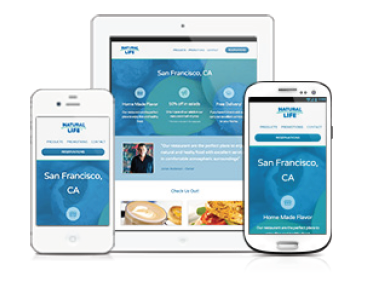 With Empowerkit, you have the opportunity to design a mobile site too! And here I’ll let you know some of the things you can do to have a fully functional and user friendly mobile site. With Empowerkit, a responsive design is part of the package. It’s automatic! As soon as you finish up your site and publish it, it’ll be responsive and ready to go in all devices. So consider it done! Even if you don’t design a specific page for mobile, your site’s layout will change its width to fit your screen. At the same time, all the apps will be rearranged to be displayed in a single column. Keeping it clean and organized! We have a variety of apps that can help you achieve your mobile site! Text, buttons, maps, galleries, images, videos and many more will take you to that level of usability that mobile users want from you! You can easily move everything around so the design is just as you’d like it to be without coding (from backgrounds to colors, sizes, typography and more). As said before, the layout changes to adapt to the new screen dimensions and it rearranges the apps so it makes sense to those seeing it on a mobile device. In Empowerkit, we know that people don’t interact with a laptop or desktop the same way they do a mobile device. That’s why, upon encountering one of these gadgets, the platform will change the behavior of certain apps so they adapt to their new platform. For example, the image gallery: instead of clicking arrows like you normally would in a desktop to view each of the pictures in the gallery, the app will be optimized so the user can slide through them using their finger. It’s the way these gadgets are meant to be used! It’s no joke that mobile devices are the new way to go with Internet users: people live through their gadgets. So, if you want to show up when they’re looking for your business in their site, be sure to choose a private label website builder that will give you control, flexibility and the ability to market yourself no matter the size of the screen! Try Empowerkit, the Private Label Website Builder!